It's well documented that runners are a strange and neurotic breed. We punish our bodies in pursuit of PRs, BQs, weight loss, runner's high, self actualization and enlightenment. The thing that I sometimes forget is how irrational the sacrifices are that us junkies are willing to make. To best illustrate my symptoms of a neurotic running enthusiast, I've sketched out a timeline of events for Sunday, May 6th. 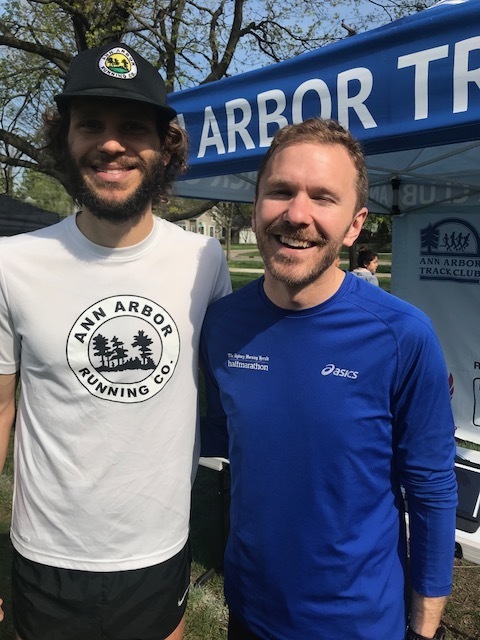 A few things to keep in mind before diving in: 1) I volunteered to set up the Ann Arbor Track Club event tent for the Burns Park Run. The race doesn't start until 8:30, but a tent needs to be in the air at least 60-90 minutes in advance. 2) Sunday marks the final day of my own marathon training plan before reaching the bittersweet taper stage of my march to Sugarloaf. As an aside, it's been a particularly grueling cycle. I've been rehabbing an injury while trying to build enough fitness to shave about four minutes off my current marathon time. Plus, I'm doing this while starting a new job and directing a race. Fortunately, my plan only calls for 12 miles this Sunday, so I only need to carve out about 90 minutes, rather than the requisite two and a half hours I need for a 20+ miler. However, this still means that I need to be running by 6:00AM in order to get to Burns Park by 7:30AM to assemble a tent, and shake hands / kiss babies for a few hours. 12:15AM: My girlfriend arrives home from the party I had vacated two hours ealier, expecting to find me asleep. Instead, she discovers me meticulously arranging slides on a tablet, in a last dtich effort to create some promotional content for BPR. I assure her that I'm almost done, and will come to bed in about ten minutes. 1:30AM: 40 photos and 75 minutes later, my perfect slideshow felt like a fair trade for the precious sleep time evaporating away. Realizing that my alarm clock will sound in exactly three and a half hours, I debate cancelling my run with Jorge, one of my favorite runners, in favor of more sleep. 1:35AM: As I'm texting Jorge, an alternative plan presents itself. Instead of running through the serene landscape of Ann Arbor's Northern country roads and cutting things short, we could start in Gallup Park @6am, run an out-and-back to the new Dixboro path, then finish in Burns Park to set up the tent. Already exhausted and convinced that my text is incoherent, I go to sleep convinced that I'll wake up to a "WTF are you talking about?" reply from Jorge. 5:10AM: To my surprise, I wake up to text from Jorge, timestamped @5:08 saying "I am up. Call me anytime." After a 30 second conversation confirming my crazed plan, I realized there was no turning back now. Feeling pinched for time, I still forced myself to stretch for a solid 20 minutes, determined to stay injury-free in the latter stages of my training. 5:40AM: Arriving at Burns Park before sunrise, it had a feeling of anticipation that is only found on race day. A few organizers were working diligently on the packet pick-up station, with an efficiency that suggested they had been awake longer than I had. After a brief conversation about where to set up my tent, I drove my car across the basketball court blacktop, and dropped off my supplies. 5:55AM: One of the reasons I love running with Jorge is how punctual he is. We try to hook up for dinner every few months, and now matter how early I arrive, he always beats me there. Unsurprisingly, this is also true of our running dates. Within minutes, we had exchanged pleasantries, confirmed the route / plan, and settled on a pace that we knew would probably be left in the dust. 6:30AM: Four miles in to Jorge and I's run, we were turning our legs over at rate that dangerously resembled marathon pace- a good :30 faster than what we had agreed upon. With Jorge still recovering from an epic Boston Marathon monsoon performance (3:00:24) and me trying to keep the powder dry for my race in two weeks, this was not the plan. But, our problem is that we love talking about our training, other runners, future race plans, and the neurosis that comes with our beloved hobby. We agreed to slow down, knowing that the scorpion always stings the toad, and we would both be left feeling the effects of our lack of discipline. 7:10AM: Climbing the never-ending Devonshire hill from the Gallup entrance to Washtenaw Ave was meant to slow us down, but our pace stubbornly refused to waiver. It turns out that discussing venues for interval workouts, goal times for future races, and ways to make the Gallup Gallop a success is a surefire way to keep the pace flying, despite being sleep deprived / beat up from a recent race. 7:15AM: You know someone is a good friend when they are willing to meet you before 6:00AM to run, help you assemble a relatively complex tent apparatus, all without a single complaint. Ann Arbor racing veteran, Dr. Dave Jacobi and I chatting in front of the AATC tent. Dave is the kind of runner you always look forward to running into. His positive attitude is contagious. 7:30AM: Tent assembled, Jorge and I hunt for Gatorade to fuel us for one more mile to finish our run. Leaving the race expo, I'm certain that I would not have been able to get that done in 15 minutes (or at all) without the help of a kind runner. 7:50AM: Drenched in sweat and my legs feeling like jell-o, I'm sort of dreading the next three hours of man-ing the AATC booth. Then... a Frank Shorter sighting! He might be 46 years removed from his epic win in Munich, but the guy still looks like an Olympic runner. Taller than I expected, his graceful stride is a dead giveaway that his bio-mechanics must have been off the charts at the height of his powers. 8:05AM: Black Diesel saves the day with free coffee. Two cups of piping hot Colombian blend, and I am ready to start campaigning. 8:30AM: The gun is about to go off for the 5K, and I see my friend Ian Hancke flying from his yellow Ann Arbor Running Company tent to the start line, just in time to for the start. 8:45AM: Looking like Forrest Gump at the end of his running odyssey, Ian comes flying down Wells St. and breaks the tape in 15:48. Seeing your friend win a race isn't as cool as winning a race yourself (not that I would know), but it's still pretty great. About five minutes later, a pack of elementary school age kids come barreling in, leaving me very impressed. Run Ian, Run! Winner of the 2018 Burns Park Run, Ian Hancke. 11:00AM: After a full morning of chatting with other enthusiastic runners and plugging my event, it's time to close up shop. A true sense of agony washes over me when I realize that I don't have Jorge this time to help out. Lucky for me, Carter from Frog Prince Studios must have recognized my dismay, and comes to lend a welcomed hand. On a side note, it's kind of amazing how much cargo a Subaru Crosstrek can hold. 11:45AM: It's brunch time @Avalon, and I am famished. I had a banana six and a half hours ago, half a bagel around 9:30, and need to replenish the calories from my 12 mile run with Jorge. But... it's taper time, and I need to cut about 3-5 pounds before race day in two weeks. No pancakes or french toast for me. It's steel cut oats, and avocado toast today. Being disciplined when your stomach is clamoring for delicious carbs is tough, but worth in in the long run. Full disclosure... I caved in and order a side of bacon. I need to replace some sodium from all that sweat, right? 2:45PM: After a standard grocery run and finishing my Sunday house chores, it's nap time. My legs melt like butter between the cozy sheets, lulling me to sleep with their mellow hum of relief. 5:45PM: Three hours of sleep and I feel like a new man. With a second wind motivating me, and a literal breeze gently gliding across my backyard, I'm ready for another project. For the last week, I've been putting off an item on my race director punch list. Last month, a local blacksmith agreed to provide an in-kind donation of 60 horseshoes that I'll use as part of the age group award plaques. But, because they are authentic horseshoes, they all came coated with rust. Thanks to the Internet, I know that white vinegar, a splash of Dawn, and Barkeeper's Friend will loosen up the rust, and help rejuvenate the horseshoe's mojo. The prescription only called for a 24 hour soak, but thanks to a super busy couple weeks, my shoes have been soaking in my garage for 11 days! Amazingly, the rust slides right off every single horseshoe, restoring each of them to a perfect state of rugged elegance. The undertaking takes about 90 minutes, but it is time well spent, and seeing each shoe restored provides me with a blue collar satisfaction. Jasper, the best runner in the family, keeps me company while I clean horseshoes. 8:15PM: Jasper, my dog, runs back into the house and delivers a dead rabbit on the living room rug. I know this has nothing to do with running, but it was the most exciting event of the night, and it felt dishonest to leave it out of this story. 10:00PM: Officially in taper mode, I spend the next 90 minutes reading race recaps from Sugarloaf Marathon, where I'll be running in two weeks. With some detective work, I find data on Strava, MapMyRun, FindMyMarathon, and MarathonGuide. 11:30PM: Nodding off as I study elevation charts, I tap out, and set the alarm clock on my phone. It's been an awesome day for a runner, but two lingering questions continue to keep me up at night: How am I going to PR in two weeks at Sugarloaf? and How am I going to get 500 people to sign up for Gallup Gallop?